When you ask "What should I do?" a lot of people will answer "Follow Your Passion!" But what does that really mean? Have you every asked yourself, "Should I follow my passion?" Today I team up with my biz partner and friend Travis to give you a little taste of the Location Independent lifestyle- we discuss passion and what it means to business and your lifestyle. Plus what should you do when you are worrying about what you should do when you get back from a long ... See More trip? Listen Now To Learn: How to truly assess you passions Why not to worry about what you are going to do next Why you shouldn't be scared about starting a business around your passions The difference between hard work and passion Why it's important to take a long term view Why you don't always have to have the right answer right away The true reason you follow your passion How to see the value in everything How homework can actually be beneficial And much more! Resources mentioned: Location Indie Ram Daas Mike Rowe Tim Ferriss Seth Godin Guitar Moves The Paradise Pack Nelson Mandela Be sure to check out the Paradise Pack that goes on sale May 31st. Zero to Travel listeners will get an awesome bonus here. 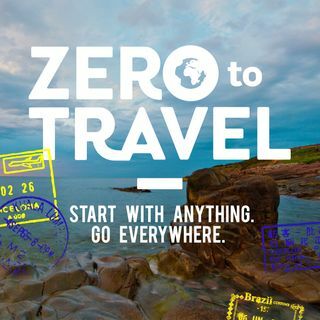 And for more Zero To Travel Podcasts, head over to the archives now!